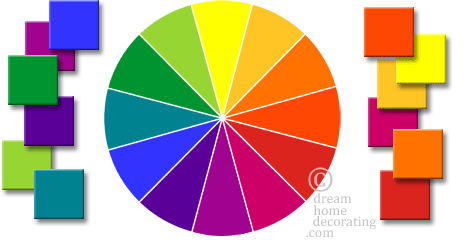 a) 'Warm' colors, in the most general terms, are related to the yellow/red side of the color wheel chart. They attract attention and are generally perceived as energetic or exciting. b) 'Cool' colors, on the other hand, sit on the blue/green side of the color wheel; they are generally perceived as soothing and calm. No! Yellow and red are just more obviously warm than blue or green. But you'll see below that it's much more subtle and interesting than this! 'Cool' Yellow ... 'Warm' Blue? In this graphic, one panel of colors is 'warmer' than the other. if blue in itself is a cool color? Cool yellow has a bit of green in it, warm yellow tends toward red. Cool red looks a bit bluish, warm red has a yellowish cast. Cool green has a blue bias, warm green a hint of yellow. Cool blue looks a bit green around the gills, and warm blue has a blush. Now, does this mean there aren't cooler or warmer color groups? Of course not. Blue is still much cooler than orange, even if it's a 'warm' blue. But it's the subtleties that make all the difference in a warm-and-cool color scheme. Talk about subtleties ... it's been proven that we humans are completely unable to see and remember how colors look in isolation, independently of their surrounding colors. This is because the 'background' colors can strongly interfere with how a color appears to us. Which green is cooler than the other? ... Click A Pic !